A completed project at Thomas A Becket Middle School is an example of a triple conic tensile fabric structure which is a quick and easy solution to create a space for pupils to dine and socialise while also creating an architectural statement next to a new school building. The canopy provides a weather protected space when transferring from an internal teaching space to the school field while also being aesthetically pleasing for staff and students. Tensile is an area of the canopy market often thought possible only for high-cost bespoke projects and perhaps seen as unattainable for those on restricted budgets or smaller schemes. 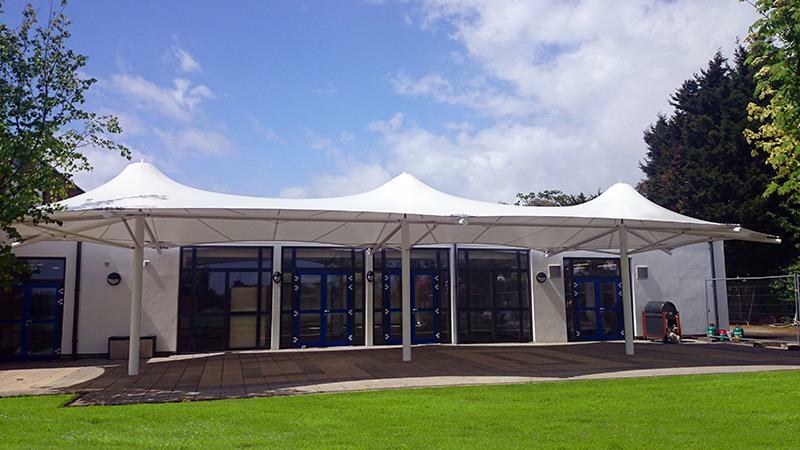 Realising this and wanting to make tensile’s exciting designs available to more schools and to simplify the process of specifying tensile canopies, Fordingbridge have developed a ‘Predesigned’ tensile canopy range. This range of eight designs, enables certainty from cost, through to manufacture and installation timescales and ensures minimal disruption to your school. From order, we aim to complete your canopy on-site within five weeks. The range includes single, double and triple conic canopies. Also available is a cantilever design great for walkways or next to buildings. All designs are constructed using our proven and 100% waterproof, 750g/m2 fire retardant tensile fabric and CE marked steel. Perhaps you would like to create an inspiring, all-weather social and breakout space to be used for teaching as well as during break time by staff and pupils. The perfect solution is our 10m octagonal structural timber canopy with Opal 60 roofs and mill finished aluminium gutters and downpipes. The Opal roof fabric is 100% waterproof, allows 60% light transmission and protects users from harmful UV rays. The use of timber provides a warm and modern aesthetic to the canopy which will undoubtedly become a great addition to your school environment. This all-weather, affordable solution encourages outdoor learning and alternative ways of delivering the curriculum for staff and pupils. Regular exercise is proven to provide social and personal benefits as well as improving physical and mental health. Participating in sport at school can be the first step to a lifetime of activity and the countless benefits that follow. In addition, sport uptake at a young age facilitates competition at the highest level. Good teachers have a key role to play in ensuring that children and young people reach their full potential in PE and sport, but excellent buildings and school grounds also play a vital role. The best PE and sport facilities are attractive, inspiring and functional all year round, contributing to an enjoyable teaching and learning experience. Using a canopy to cover a MUGA allows year-round sports facilities. Covered MUGA’s also have the ability to provide more sporting opportunities for the surrounding community and create additional income streams for the school, enabling further spend on other important areas. "Good design is about providing buildings and spaces that are fit for purpose and built to last - but also lift the spirits of everyone who uses them." Creating Excellent Secondary Schools, CABE, London. A 25 year guarantee comes with the structure and galvanising, 15 years on Polyester Powder Coating and 10 years on the tensile fabric to give peace of mind and demonstrate our belief in our products. Fordingbridge work directly with schools, architects, contractors and LEA’s, adding value to the whole or part of the life-cycle of your project. If you have a space you would like to transform, call us today to see how we can help.